After teasing it last week, the gameplay trailer for MLB The Show 19 has arrived. Check it out below, along with some screenshots captured from it. Well, underwhelming. The graphics looked like they came from years ago. I dunno, I'm just not going to get excited, or ticked until I see more, but that wasn't very impressive for me. I know, I know McCutchen was in a Pirates uniform, but this isn't an intention to detail they should have messed up. Nothing exciting same game I can't tell what has changed. I am holding off pre ordering til after streams. The only thing that had me curious was the retro filter at the very end with Willie Mayes and "The Catch". Other than that.....waiting for the twitch schedule to mark down when the gameplay, presentation and franchise streams will be. That trailer was all about Diamond Dynasty. And that's cool. That is what all the kids and newer generation of sports gamers are drawn too and DD is easily the best card collection mode in all of sports gaming. It's just not something that makes me excited. I will wait for the streams. Kind of a bummer for franchise players like myself. Trailer looks to be geared towards RTTS and DD. The favorites, contenders underdogs, longshots screenshot looks to be another new feature similar to phases that doesn't do much. Franchise mode needs to be much deeper. New RTTS features. That's cool, I guess...But unfortunately I don't think there is going to be much added to franchise mode, besides possibly online. only thing i see added to franchise mode based on the twitch schedule, is contract extensions. This i think would mean you can talk contract extensions during the season(which would be nice obviously) but that looks to be about it for franchise which, lets be honest, looks underwhelming. Love they finally have throwbacks look like they actually did instead of just using their modern model. Willie Mays is an amazing addition although I’m sure I’ll never get him haha. I saw Realmuto in generic catchers equipment. But I'm thinking if Nike catchers equipment was added to the game, they wouldnt show off in the trailer. I don't know how to feel about this or the "gameplay" trailer. I didn't play 18 because of the lack of additions to franchise however this year I'll be getting 19 because I want an update version of The Show. I hope they're hiding the surprise new additions for franchise! Looked the same to me. Just high socks style. Color me unimpressed. Also I have no idea what in the blue hell that song was in that trailer but it damn sure wasn't music. No wonder why the promotion for this game starts in February now. If it started any earlier, they'd be talking about nothing in March. Game looks exactly the same. Keep adding new modes nobody asked for while ignoring the ones that have grown stale (franchise) or disappeared completely (online franchise). Amazing how far this game has fallen in 2 years. Small observation but on that screen that shows the teams broken down by whether they are contenders or not, the Marlins old logo was there. On the positive side, Ozzie Albies must have had a face scan cause he looks much more realistic than in 2018. I'm like 80% sure that's Tobe Nwigwe, an up and coming rapper. I never expect much from the MLB gameplay trailers, the gameplay is already quite good and the changes are generally very subtle so you won't notice much in the trailers. Still, this at least confirmed that the leak from earlier this week was real as this trailer basically showed all of the screenshots from that. Curious to see more about that. Snoop Dogg is a rapper. Whatever that was....only God knows. Remember " Work in progress "
Looks like they finally removed the tarps in the 3rd deck of the Coliseum but still have 2012-2013 AL West champion's on wall. Looks like they made some necessary tweaks to the fielding and added some urgency to the throwing. Can't wait to see more of the adjustments to the fielding. The “franchise “ stream is not even called the franchise stream. I’m still hopeful but a little worried. Hoping they were able to get rotating inter-league schedules in this year. I really liked the trailer, made me a bit dizzy but it was exciting. I'll let others brake it down fram by frame, but I saw a lot of focus on sliding and tagging which is good. Also the jersey on Rizzo look really good. Has the "Holy Toledo" sign always been at Oakland Coliseum? That jumped out at me for some reason. Looks good. Looking forward to the breakdown of what they've added this year. They showed the two versions of Gwynn which didn't strike me for anything, but then they showed two versions of McCutchen and I started thinking, are they going to let us alter hair/facial hair on real players this year? Man Rtts looks like it could be great this year. The lifting mini game reminds me of Fight Night training. Be a new throwing system perhaps? Would love one for rtts where you aim your throw like a first person shooter. Meh. Looks like every other year. Yeah I think kinda of with showtime as another user mentioned, but it's kinda limited. My guess would be that different cards in DD could have different appearances based on what the player actually looked like that year. Well, thankfully dusk skies are not brown anymore... now they're purple. At least that's a more natural "pigment" you would see in real life. Trailer definitely reals the hype for baseball season regardless. I would have a hard time calling that a gameplay trailer. I am sure there are some nuggets in there somewhere but gameplay was definately not the focus in the vid. It is what it is. I don't really think there's anything else they can do until PS5. I just don't understand "game play" anymore. They said it would be a game play trailer. I saw highlights of animations, but I didn't see game play. AND, I feel sorry for the state of video game baseball on social media. 2K and Madden release a trailer and it trends top 10 worldwide and top 5 USA. 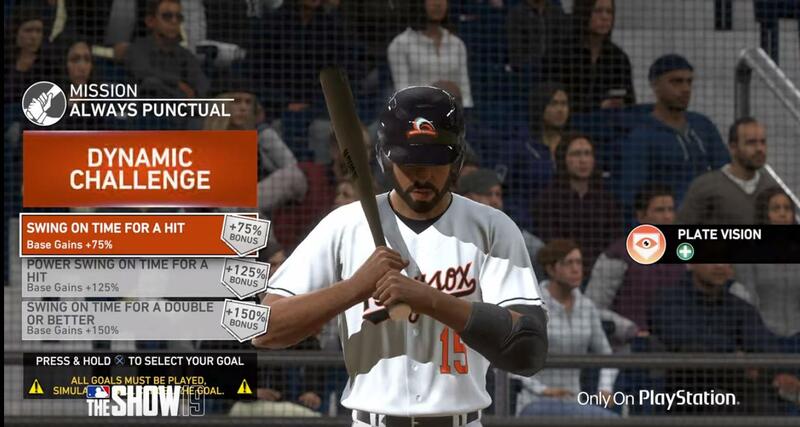 MLB The Show can't get in the top 20, and yet they dive deeper down the rabbit hole of entertaining social media as their form of communications. I know, I know McCutchen was in a Pirates uniform, but this isn't an intention to detail they should have messed up. Did you miss the shot right before when it showed him in Phillies getup? Did you see the two different Tony Gwynn appearances? It is showing a before-after thing. Within which context? I am not certain. I'm guessing it has to do with Diamond Dynasty like where you can collect cards of players from certain seasons. It wasn't a "missed attention to detail," though. Loved the new fielding animations. The play at 2nd where Dansby runs out of the baseline, puts a tag on, then goes home for the double play looked great. Fielding tweaks were definitely shown off in this video, much needed, and looked good. To be honest, if I was counting on this trailer to sell me on '19 it wouldn't have done it for me. But only because the look of the game, to me in a really short clip after watching it once, looks A LOT like '18. Though I feel '18 played a lot better than '17, and was much less choppy as far as frame rate...I definitely played '17 WAY more than I did '18. Listen, I love baseball and I freakin love the Show. I never play online, rarely touch DD, will play RTTS but only a little bit. So, like most in this thread it seems, I'm primarily a franchise guy. And like most in this thread have mentioned, Franchise has grown very stale. For someone like me, it's not the worst thing in the world. I primarily focus on just playing games anyways. But for everyone that dives deep into this mode, I get their frustrations for sure. I've been playing the Show since '06 on PS2, but the Show really grabbed/hooked me when they implemented Quick Counts and you could play an entire game so much faster than before. I will be pre-ordering '19 for sure. I often play the Show on the tube, while I have a real baseball game going on MLB.tv on my iPad sitting next to me on my couch. This won't change with '19. However, I did just want to say that even though I'm going to buy/most likely love this game, it definitely seems to be getting stale. Hopefully there are enough gameplay tweaks in '19 to make it feel fresh. Im sorry a lot of you feel the way you do, I love this time every year, I have my digital MVP edition already paid for. I can't wait, this is one game I look forward to every year. I for one am Always excited. Whos going to let them know they released a 2013/14/15/16 gameplay trailer instead of the 19 one? Check games like red dead redemption 2, God of war, spiderman mortal kombat xl and the new 11, I can name more. The weight training they took that from 2k19 period. This stuff looks honestly not quite the same but not necessarily new either, but physics for example was hyped up back in 17, I can remember them saying how the ball placement would be better, well what they do ? In this trailer they show a ball in a more zoomed in canned animation to see how close it got to the line. Let's see..throwing animations that was showed off for 15 and 16 going into 17. What they do show yet another zoomed in canned animation from someone throwing from 3rd base. Hmn how about let's take another adventure down memory lane to mlb 14 when they was showing off the new supposedly field mechanics back then, well what they do in this trailer so yet another zoomed in canned animation of the short stop bumbling the play. I mean I know it comes off like I'm hating, I get it, but I promise you I really am not, I'm just so tired of companys claiming to be doing something for the better of a product that they swear up and down they care and love so much but yet since mlb 14 now going into mlb 19, look where this game is at. I dare anyone to go back to the previous trailers for each series and tell me im lying? I have been a loyal customer since this game has surfaced, technically i was there when it was 989 studios and buying them then. So yeah i get a little......... upset when i see almost the same stuff I've seen from the past. Trying to be pasted off to a younger generation as something totally new. I dont buy let's wait to ps5 stuff, that was said since ps2, and each generation yeah it got better graphically but some core game play elements that should have been in place have not and dont seem to be coming back. Super mega baseball 2 has true baseball core elements and is an extremely fun game. You put them elements into the show, NOW YOU TALKING BASEBALL. You think I'm going in on them now,? Nah not yet I'm saving that specifically for so called franchise stream on twitch. Smh..so ashamed they use to be better than this. Ah you know me Country, i was an AVID show man, but its ground me down so bad now i have no interest in the game and doubt ill ever buy it again. ...but its such a shame, SCEA has gone from being one of the most innovative developers out there to just chasing the quick buck and letting the game go completely stale. Sure it'll still be a good game, but the lack of competition in this market has killed this game. I have played sparingly in Oakland in '18, I guess I didn't remember it. I think you misunderstood. I mean like how modern McCutchen doesn’t have his dreads but Throwback does. Last year Throwback McCuthcen didn’t have dreads. He looked exactly the same as modern. I guess I am in the minority here because I think the game looks gorgeous on my 4K TV. This "Gameplay" trailer was pretty much exactly what I expected it to be. Crappy overlay music with very fast moving close up shots of gameplay. If you watch lasts years "Gameplay" trailer and the one before that and the one before that they all pretty are similar. And I don't mean that in a negative way. These gameplay trailers use old footage compared to what the released version will have. So as far as player jerseys and stadiums a lot can change when you get the game. Only other thing I can say is if this "Gameplay" trailer that was released today was footage from Playstation 5 then hell yes I would be highly disappointed but it's not!!! Really can not wait for next weeks twitch streams. The trailer didn’t do anything for me. I liked the stream schedule release more since that has some more info. Not impressed I’m thinking about purchasing an Xbox One X and hope and pray that PS5 brings the graphics that we all want. I've gone down a rabbit hole of listening to his music now. His voice reminds me of Big Boi mixed with Clyde Carson on that "Slow down, I know you can't catch me" GTA5 joint. Any idea what song this is by Tobe in the trailer? I've only heard a few of his songs, so I can't say for sure, but I'm guessing this is a new song that he hasn't released yet. Or at least it's not one that I recognize. Few things I noticed when digging into each scene . . . I won't be delving into RTTS or DD at all as I don't play those modes, these are only things I noticed from gameplay screens. 2. In the screen of Sale on the mound, the second basemen is shifted towards the middle of the field. While this is all fine and dandy, I hope shifting is a bit more realistic this year. Managers don't shift for every single power hitter in real baseball. 3. Sale looks skinny. Updated player model? Don't remember how he looked in 2018. 4. Gardner on the scoreboard in the Price scene. Not a big deal, but Gardner isn't expected to start this year. 5. I could be wrong, but Fenway looks updated. 6. 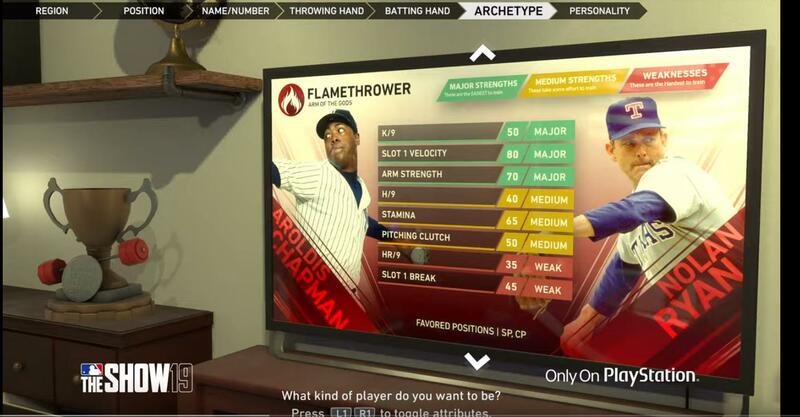 In the Create-a-Player screen, for Slot 1 Velocity, it says 80. If this is for either Chapman or Ryan, this could be good because both of them throw in the 100s. If velocity is at 80 for someone who throws that hard, perhaps there's a possibility that velocity this year doesn't max out at 101 like every other year. 7. 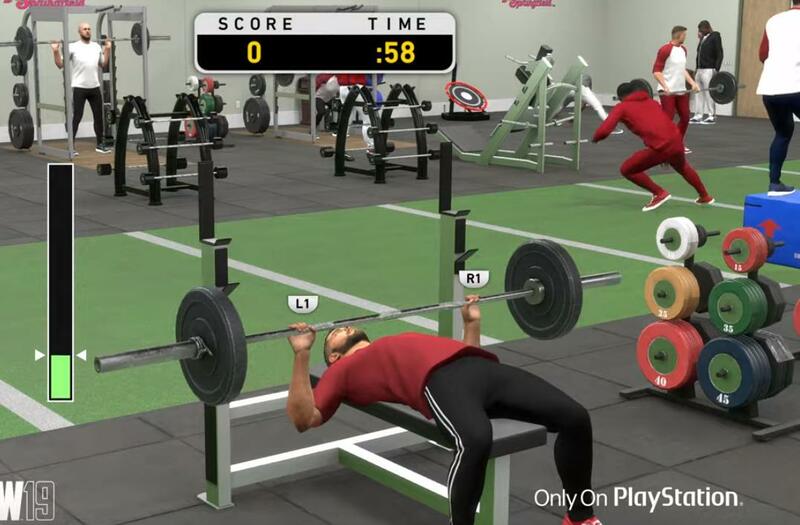 The weight lifting scene looks interesting as there's a meter that you clearly control with L1 and R1 buttons. 8. Some throwing animations look updated. 9. Others already mentioned the Gwynn and McCutcheon stuff. 10. Tagging and urgency finally look better. Last year they marketed the "new" tagging system and it literally was HORRID, worst in years IMO. The urgency in swipe tags seems back now. 11. In the scene where Kolten Wang is getting up at third base, the emotion by the third base umpire looks great. Would love to see some umpire emotion on calls. 12. Never seen a CPU fielder touch third for a force and then throw to first. Interesting touch. Looks like humanity AI might have been improved. 13. LOVE the scene where the umpire ducks down on the line drive down the line. The umpire ducking looks fantastic, but what really strikes me is that the ball actually landed FAIR! Last year they removed that entirely in a patch, line drives down the line were very rare again. Looks like hit variety was improved again, which is NECESSARY for realism. 14. All colors look updated, including Red Sox red and Rockies purple. 15. Grass looks more realistic as well in that down the line shot. 16. Yankee stadium also looks updated with the scoreboard in center and the clock in left center. Also the lighting looks updated too. 17. Giancarlo Stanton is ENORMOUS in real life. The model simply doesn't do him justice. 18. When Stanton hits the home run, the crowd reacts accordingly. Would be nice to see fans react properly in certain situations. Last year was hit or miss. 19. In the Yankees double play scene, looks like Tulo is playing short and Lemahieu at third which is good (I guess Andujar had a day off), however the scoreboard says it's the fourth inning of a 2-2 game, yet the batter has already had 5 at bats, including 3 consecutive double plays in the 6th, 8th and 9th innings. 20. Purple skies look great. 21. The infielder boots look FANTASTIC. It looks like they may have done away with the pathetic infield error animations and actually made infield errors realistic. MUCH needed. 22. Kershaw covering first on that same booted ball scene . . . let's hope they finally fixed pitchers covering. 23. In the phase screen, it says Attacks, My Territories and My Fans. These could definitely be franchise improvements. Rivalries? Attendance? I can't say I agree, I see some guys talking about graphics, I mean what about graphics? This game is still one of the best looking sports games around IMO. Also isn't every sports title released year in and year a cookie cutter release? Ala- NBA 2k, Madden? Maybe its because I'm a huge baseball fan and the Show for me always makes baseball season even better. Like many of you, I have played baseball, and baseball games before computers and such. I temper my feelings of not getting too excited or too negative about the upcoming release. 1. Above all, I love that we have the gameplay we have in this game. It has the 'playability' factor for me. I would not sacrifice gameplay for another feature. 2. I know that offline baseball is not a money maker for them and will not get the needed attention that I feel it deserves. It is a fact and I must accept that. 3. I do look forward to the release, and will stay away from here for a while after release so I don't read the negative comments. If I see something, then I will know. 4. The game really needs real competition! With that said, bring on the game. 'Play ball'. #23 sounds like Conquest mode in DD. So, I'm assuming these are all extremely early builds of this game used in the trailer, right? Because I saw zero new equipment and guys like Stanton still had that bulky old generic elbow guard that no one wears anymore. I REALLY like that clip of Swanson tagging and then throwing home - because I can appreciate how quickly the throw input had to have been accepted (you can't preload in this situation, otherwise you'll never make the tag). That's a smooth fielding animation on something that almost never is smooth in previous games. I think it's more likely that the attribute is based on the 20-80 scale. If you have an 80 velocity rating, that means you would have potential to have the highest velocity possible. Chapman & Ryan would be 80-grade velocity guys. Jordan Hicks would probably be another example. That being said, I also hope there is a possibility to get Chapman-like velocity. Agree with the rest of your post tho. A sideline reporter could be interesting, I think Shehadi has the voice for voice over work. And I'm gonna disagree with the color filter only being for the Willie Mays catch in the trailer - that should be easy to implement in the actual game. No reason to just tease us like that. Other than that, typical "sizzle" trailer - nothing in-depth. Nothing to really criticize in there. That did look sweet. What about the clip right before that, with Trumbo mis-reading the ball and coming in a step, then saying OH CRAP and bailing back towards the fence. Is that new? Don't think I've ever seen an outfielder react like that, but I could be wrong. Mis-reads by outfielders was in last year. Nah, that one's not new - I've seen fielders (usually low-rated ones) break the wrong way on an outfield fly ball and potentially miss it if they're too slow to catch up. I know it was in last year and maybe the year before too. It could be an indicator of the fielding ratings having a bigger impact on gameplay though - I'm sure we'll find out if that's the case during their rewind stream. Trumbo's fielding ratings are....not good. Edit: Hah, looks like I was beaten to it. Gotcha. I know I've seen outfielders miss-play balls, and then try to jump 20 feet in the air to still catch the ball lol. Just wasn't sure if the 1-step in...oh crap I need to get back kind of thing was in the game or not already. Its a cookie cutter release with a few tweaks thats now mainly catering to making the $$$ from DD..
.. SCEA has gone from being one of the most innovative developers out there to just chasing the quick buck..
Game looks identical to me. Was hoping we’d get retro fitted uniforms, or pullover uniforms(without buttons). I’ll watch again, but it all looks very similar. Did they fix front number size ? Didn’t catch it earlier. I still think there's going to be a new Classic Moments mode. The initial teaser had Bartolo hitting his first home run, this trailer had Griffey making a catch at the wall and the Willy Mays moment. It also said "Relive History". Looks like Rob Dibble is in this year. Dont remember him being in before?Right around the one minute mark. I agree and said the same in the Twitch schedule thread. There's also a screen that says "Relive the career of Babe Ruth..."
I dont think new equipment is ever shown in trailers? I could be wrong. There's also a screen that says "Relive the career of Babe Ruth..."
if your gonna do that, you gotta be able to pitch, and play outfield. I certainly hope so, but I couldn't quite tell. 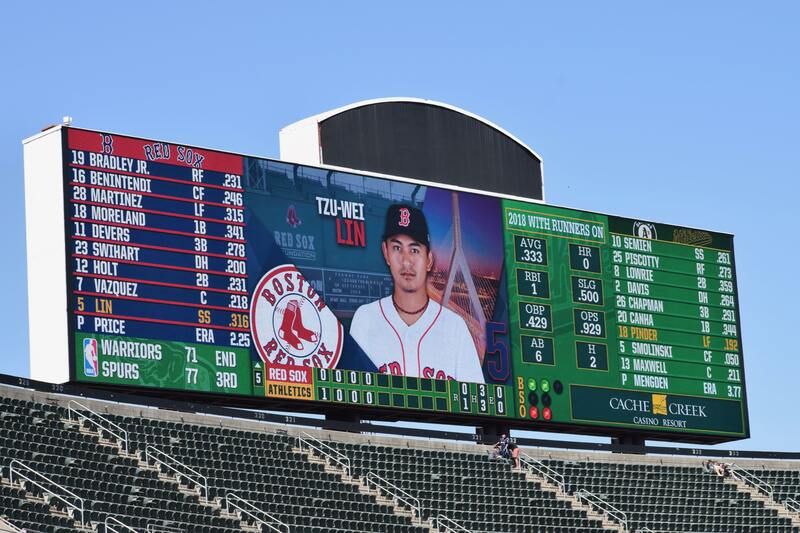 Looks like the video board layout wan't updated to the 2018 version, though. Perhaps that clip was from a previous build. Too many complaints. This is just an announcement trailer. This happens every year, the trailer comes out people are disappointed because they’re expecting a lot more. This trailer didn’t appear to feature any new equipment and I suspect it was taken from multiple builds. There was a similar reaction last year, and last year‘s game was a pretty big leap to me in terms of graphics and animations. I suspect they’re saving much more for the streams. Dont see any signs from the trailer or stream schedule i know its minor to some but has anyone spotted anything or read about the replay system being expanded other than the same outdated first base challenge? Also the weather and/ or rainouts possibly getting incorporated more.. Updated the link in the OP with a ton of captured screenshots, for those that are interested in finding some more nuggets. Nice finds so far by many of you. Looking at those Wrigley screenshots (thanks Steve!) I see an additional, smaller video board that wasn't there in 18 (on the roof of the top level seats). I don't usually catch these kinds of things until they're spelled out so I was surprised when I went back and saw it wasn't there last year. I doubt this will ever be touched. It's a shame, challenges are a big part of Baseball now. Animations and player models look so stiff and dated. They really need to redo them from the ground up to make this game next level. Sadly “gameplay” to them means video game play. Not on the field baseball action. Anything from the video game is technically gameplay, so menus, DD, training in RTTS is all considered “gameplay”. But I really hope that fielding is better, smoother, quicker, less canned animations and more weighty. Also hope fielders can lose their hats now during play. Outfielders lose their hats often when racing for balls. Mays lost his on “The Catch”, put that in for regular game play, please. Would’ve liked to have seen bunting in this video. Hope rocket bunts are gone. Is it just me, or does that Matt Chapman animation not look quite right? He overruns third base by a step before going for the leap throw, instead of leaping off the base and he doesn't transfer the ball to his throwing hand until after he's stepped on the base? Maybe I'm wrong, but in my head you'd have the ball ready to throw as soon as you got to the base in that situation, it almost looks like he only starts thinking about the throw once he's tagged the base? I used to feel this exact way, but the past couple of years I'd have to disagree. I think Madden and NBA have pulled ahead by quite a good amount in the graphic sense department, while only NHL has lagged behind. I'm a gameplay guy first, and that's why I love the show, but I have to admit the presentation/graphics have gotten stale. I remember being blown away by the way the game looked on PS3, and now I don't get that same feeling. I haven't skipped an edition in over 10 years, but this year may be the first year I wait to purchase being an offline franchise player myself. I just wish big moments felt/sounded like big moments in the game because that's what makes real baseball so great. In real life? Sure, that's ill-advised. It's probably not so easy to do in game, though. You can't preload your throw to first a couple of steps before being on third, and the game likely won't create a transfer beforehand in case you attempt to tag a player at some point (theoretically, you should have the ball in hand anyway even if you intend to make a tag if you're not planning on outstretching your glove hand, but that's neither here nor there). The branching just wouldn't be right from a programming standpoint, at least not without exhausting quite a bit of time to it. Also, not to be “That Guy” but the nerd in me must point out that Cutch never wore the yellow jerseys while having the dreads. I’m sure someone was all proud of themselves by taking the time to show him in a throwback uniform with his former team as a way to sell DD and be more legitimate, but they done f’d up ha. Not too bad! I like what I see so far. Looking forward to the twitch streams for MLB on franchise features. Hey, whatever they improve is a bonus for us non-DD players, we have to appreciate whatever they add. This is still the best baseball game for any consoles out there so if DD is KING and making $$$ for SDS to continue making this game for us baseball fans then it is alright with me and all the baseball fans out there! I'll wait for more. But nothing moved me at all about that trailer. Same graphics. A bunch of diamond dynasty stuff. Nothing exciting to me. Hype video with music intended to reach young guys just finding hair under their armpits. Animations (not "game play"), a number of which don't even seem realistic. We knew it would provide us with next to nothing. The real moment comes when we get to see some actual game play footage, and those of us who are franchise guys will also again realize how unimportant we are. if someone can work out how to do rosters where rookies form 2018 won't be rookies for 2019 then for sure I would stick to an older game. but I will admit it I am only buying the game again for that reason. So defense once again boring and useless in the game. I guess animations are more important than user control. When there is no competition things remain the same. The Show has always looked good. So I don’t know what I’m seeing that’s new. The Show wishes the graphics were as good as 2k and even Madden at this point. Graphics are not the bragging point of this game. Is the gameplay but that has become stale and nothing has been done to make real tangible improvements. The defense in this game is useless and might as well just let the cpu play defense for you. Flash the Leather, Overhauled Defensive Intelligence, Player Differentiation Improvement Suite, Defensive Efficiency really got me excited. Plus Max Muncy had a nice knockdown and recovery at firstbase. Usually theres no recovering from that. That's a big YAWN for me. So we got 4 confirmed new historical players Willie Mays Jason Kendall Rob Dibble Christy Mathewson and a possible 5th. Who is this cat? As a quick blanket statement folks, Ramone Russell suggested on Twitter that equipment, crowds, and stadium designs, including several other features to in-game presentation were NOT included in this trailer on purpose. They're a previous build. As a quick blanket statement folks, Ramone Russell confirmed on Twitter that equipment, crowds, and stadium designs, including several other features to in-game presentation were NOT included in this trailer on purpose. They're a previous build. I don't care what any of you say I know SDS is doing the best they can with the resources they have! Gotta be Cobb. That’ll be interesting. Very much looks like Cobb but also looks very similar to someone who's better known for not wearing shoes. That’s true but Shoeless Joe played 400 less games in center than he did in either right or left, so it would be kind of odd to put him there for the trailer. Unless he’s actually in a corner position and the angle is weird or you’re hinting at something you know and we don’t, I’d say it’s a safe bet that it’s Cobb. That looks nothing like Michael Jacksons daddy, shoes or no shoes. I assure you I am not hinting at anything lol. I didn't even play the alpha, most of this forum knows far more about he game than I do. Although with the complaints of "gambling modes" it would be a bit ironic if they included Joe. Played Mlb18 for the first time in 7 or so months last night. Game is stale. Was really hoping to see new player models and revamped franchise. Sad. He was also in a Phillies uniform...it was probably a flashback version. I'll give Sony this, the "gameplay" video was far superior to their Bartolo Colon inside joke video. I actually thought this video was well produced--packed a lot of action into 1:38 and I enjoyed the music. Other than that, my only thought was it's nice to see Rob Dibble I guess. Nasty Boyz. Sorry, but this didn’t get me hyped. And I’ll probably pass this year. I was really hoping that they would use pbr on the grass/dirt this year. I was hoping the graphics would really pop this year. I give them props with what they have done so far but the game is started to look dated. Every year I have been getting less hyped with this game and I think this is the year I don’t purchase. Now I will keep up with streams and keep an eye open but idk, I’m at edge this year. The game still looks too washed out for me at times. We'll see if by release they can highlight some graphical improvements. I am sure there are a couple, but damn we need a PS5 and better fields. The grass in this photo looks like it's almost whitish. Why can't they get field colors after so long? The whole game just looks washed out at times. Nothing like real life. Can't tell from this picture, but the Diamondbacks are no longer using natural grass and are moving to synthetic grass this year. We get it. You're not gonna buy it. I was visiting Phoenix a couple years ago and the field look BAD in December so I can't imagine how much upkeep they must have to do in the summer heat. The issues stem from the grass needing sunlight. Problem is Phoenix is way too hot in the summer time for them to keep the roof open (during games) and having Monsoon season in the middle of the summer doesn't help either. Making the switch to synthetic grass is smart obviously and will save them a ton of money in water costs (about 90%). I honestly don't see why more teams don't do this. Old timey filter at the end there with Mays? That would be cool, like I think it was MVP 05 that had it too. This whole series needs an overhaul. Graphics. Gameplay. Announcing. It's just feeling stale. I've never felt this series has really maxed out its visuals in the ps4 either. The stadiums and lighting are so bland. I hear lots of people hating over the graphics of the show and the blendness of colours but since I bought an LG 4K OLED this game comes in a whole other league. It’s so vibrant and sharp, it feels like the sun is actually shining on the field and you wanna put on sunglasses yourself. Old tv’s don’t do this game justice I’m telling you. Back on topic: A simple well placed bunt in this trailer would’ve gone a long way! The sad fact is that back in 09 when I got my first copy of Show it was miles ahead of any other sports game in regards to graphics, presentation etc. They were the trendsetters back then imo. Nba 2k was equal perhaps but Madden, FIFA and everything else was miles behind. Fast forward a decade and the Show is miles behind FIFA, Madden, NBA 2k, NHL in graphics, presentation etc. And who cares about the 4k option if the frame rate is just atrocious with it enabled. Would much rather play with normal Full HD and smooth frame rate. The only sports game Show beats presentation wise is PES...and that is by no means an achievement. PES' graphics blows Show out of the water though. Even though I can appreciate the higher resolution and it looks good...I found the frame rate just pathetic and unplayable. Switched it back to high frame rate very quickly. Even with the higher resolution...the grass, dirt still looks like early PS3 graphics. Not sure what happened...but Show's attention to details was incredible a decade ago. Just completely lost focus and motivation/passion it seems. 2K is the perfect middle ground. Looks way sharper above 50” tv’s and the game still runs smooth! Yeah should give it a try. It just stings to play Show lately...should've been so much better by now if you ask me. I think that the colors in 18 have improved a lot. The uniform and stadium colors really pop. Red is really red this time! I think the colors shine in day games with perfect weather, and are not so good in night games. I'm not too impressed with what I'm seeing. Looks like more of the same, "let me tweak this, add that and not change anything in particular that would actually add depth to anything". I can't wait to hear what excuse they come with for why they didn't change much to the franchise mode. "We felt that adding the ducking umpire and increasing the particles of dirt that cleats produce on field was more of what players want than given the option to create an expansion franchise or build your own stadium in owner mode". Red is Red on most stuff, Not everything! God, I very nearly muted that AWFUL music. If the trailer had been any longer I would have. I would be happy if they just added it to stolen bases at 2B and close plays at the plate. I have seen numerous questionable calls in both those situations where challenges would have been beneficial. If they have the logic to do the close plays at 1B, they could incorporate these. We don't need a full blown challenge system, but please let us challenge other than 1B! If there are no updates to the replay system....this is a glaring omission to the game as a whole at this point. I am not letting them off the hook on that. The replay system in MLB is a critical component and can sometimes change the outcome of a game. "So real it is unreal" Let's go guys. A proper replay system is also a critical part of immersion and those of us that play 162 games want that! Madden is joke in that regard too for the record. It is laughable how sports games today with the tech we have can't get it right. I came from the Atari 2600 days.......I expect today this component can be done! Well they’re still swipe tagging through runners after they redid their whole tag logic. Last year. They need to get that out of the way first if you ask me. Depends on the uni and the lighting. 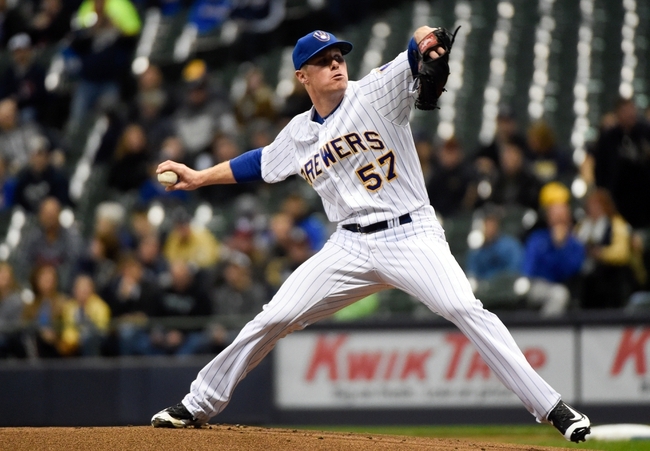 In real life the Mets and Brewers pinstripe unis look AMAZING during night games at Citi Field and Miller Park respectively. They clearly realized that their redo of the tagging system last year actually rebroke tagging as a whole. Games were lost because of the absolutely horrendous tagging logic and, as armor said, failure to implement a functional challenge system at any base other than first. I do feel the graphics look a touch dated but I'm much more concerned with gameplay omissions and at this point the show is replete with omissions. As someone said earlier, I remember when the show was known for the little things, the little nuances about their sport that other games simply didn't include. Now they're known for lacking those little things. How does a company go from literally being known for something to basically ignoring it? What music? All I hard was pure garbage trying to be music. Wasn’t impressed with the trailer. The graphics look the same for years now. I hope they bring back online franchise. If they don’t this will be my first time skipping mlb the show in a long time. All I'm going to say is, I see a lot of bashing and I'm kinda surprised, the show has always been a great game to me and Russell and his team to me always bust their butts each year, yes some things need to be fixed, but I hope all the guys talking smack have that same energy when more info gets realized and when the game does too. complain and then buy it, just doesn't make sense to me. I am a seasoned software developer and there is nothing easy about software development. So from that point of view I do think the SDS team works hard every year to improve the game and without a doubt the game does improve year after year. With that said, what I saw yesterday (the trailer) isn't sufficient for me to make a "buy", "don't buy" decision. I will need to wait for the Twitch streams (specifically the Feb 14th hitting changes stream and Feb 21st the RTTS changes stream) before I decide to give them money this season. PS: I have bought the game every year on release day since MLB 12. But just because I have a history of buying the game every year, does mean I will do it again this year. Only time will tell. But we should not judge the game based on the trailer. That is just wrong to do so. Here’s the thing. I didn’t really try to bash the game. I always liked the effort they put in but back in ps3 days. This game stood out and was really good, at least to me. But the past few years, I know I have played less each year. Part of it was the constant patches that really impacted the game. The other was presentation and graphics. This game just doesn’t stand out like it use to me. Again, I myself am not completely ruling out not getting it but I have to many other games I play and this game hasn’t changed much to validate paying another 60 bucks. I love the game, I hate their marketing approach as of the last 3 or 4 years. The secrecy doesn't make sense to me. I just wish they would just use this current form coupled with what they use to do a features/fact sheet. The game plays a good brand of baseball, just need a few tweaks. Presentation is getting better and better as well as commentary. OSD/Stats really needs an upgrade to rival the television program i.e AWS. Stumbled across this video at work. It's someone breaking down 9 things you may have missed in the Gameplay Trailer from yesterday. I found it interesting so I thought I would share. That's a good way of summing it up. That's not necessarily a bad thing IMO. It's better than making radical changes which disrupt what works about the formula. Not excited at all after watching the trailer. Looks like the exact same game as last year, and the year before. This is the first year I’ve steongly considered not buying. Honestly, the dev streams are going to have to absolutely blow me away for me to not just stick with 18. Best in it's class? Easy to be the best when its the only full fledged baseball game on the market. Not on my 4k QLED tv. It is smooth as butter and as someone said lighting is amazing. On 4k QLED tv it was like night and day from my old non QLED 4k HDR tv. I felt like I was playing a brand new game. It's not reasonable to argue that graphics look better on a premium TV. I mean, yes it's gonna look better on a 4K QLED TV, but that isn't gonna make the players less robotic. I imagine the new mode there referring to is the "Moments" mode will probably have nothing to do with online franchise or season return. I think they took a page out of WWE 2K. The only other baseball game in 2019 will have 2 way players and you would think that SDS would counter that and have it themselves on MLB THE SHOW 19. Only my opinion but I beleive this is the only reason you see RETRO MODE is becuse it challenges RBI BASEBALL. How do we know that MLBTS '19 doesn't have two way players? Well I don't for sure but it would have been in the stream schedule hidden with ****** . Also you would have seen it advertised, teased etc. Don't think that the Bartolo Cologne tease has any indication of 2 way players. You would have seen at least 1 player in trailer that was pitching and hitting even if they teased it for 5 secs. I disagree that it is something that would be advertised. There is an extremely small percentage of potential buyers who care at all about two way players. Hopefully they developed new hitting physics. 2017 was the year of "just late" swings being completely dominant and overpowered. 2018 was just hot garbage in terms of swing timing and outcomes. At times it felt like gameplay was predetermined, well-timed swings far too often resulted in weak/no contact. Even when you did get a nice swing on the ball with some exit velocity it seemed like the infielders all had mystical magnets in their gloves. Meanwhile the AI on higher difficulties can swing at pitches in the dirt and somehow find the gap for a double. If they fix that and put more control in the hands of the player, I'll be happy, if not, it'll be another meh year for The Show. I dunno I might be overthinking this but this new march to October mode has me very very nervous about franchise mode. it's like when madden got ruined when they turned franchise into this CFM crap. and 32 team control along with a billion other things (like editing players) was taken away from the game. the excuse was they wanted to have that mode ready for next gen... that mode hasn't changed in 6 years now. it's still the same and you have the take 1 hour to create 32 team control but has never really been fixed. I hope I am completely wrong on this. but if 30 team control is taken away or ability to edit players because it is a 'new mode' that takes 6 years to add back features that it once had but only do half a job bringing them back. there will be not a lot of happy people on here. having commentary presentation and franchise all combined on that 1 stream raises red flags. Is there some reason they can’t update umpire uniforms? I remember back then Madden had regular franchise and it's own online franchise and rank matches were on one server by itself and the online franchise had it's own server. My point is that there reason was the group that worked on it had them working on 2 separate modes so to cut down on the work they decided to combine the 2 along with I guess was there version of my player etc. I was not a fan of it either and the editing was not that great at the time with very limited in the main menu, but I half to say Madden 20 u can edit almost everything u bed to edit without having to do it inside CFM like previous years. Now back to baseball I wouldn't be against SDS combining offline , online franchise to finally have a true franchise experience online with real MLB schedule, editing online etc. As SDS has said last 2 years only 1 person was assigned to online franchise why we really haven't seen any changes since 2015. As we all know online franchise and season was taken out last year. So if it was combined maybe there's a larger group that could work on the one mode that all gets a upgrade every year instead of separate changes for 3 different modes season, offline franchise and online franchise. Sorry but the grass is just pathetic in this game. It literally bears no resemblance or color to actual grass in the stadium. It's absolutely amazing this team is still going with that look. Incompetent is the word I am looking for at this point. I pray for the day a baseball sim comes to PC so I don't have to look at this crap anymore. I actually played on a 4K QLED TV 2018 Model...and the frame rate was atrocious. Especially the cutscenes were horrible. Did you play in 4k or 2k? 4k is indeed pretty much unplayable but 2k is the sweet spot for sharpness and framerate. But yes need to give 2K a go. Actually considering going back to Show 17 to continue my Rtts. Will wait on the Rtts stream before deciding. They need to either up the frame rate or add missing animation frames. Animations like swings don't look smooth enough, as if they are missing frames and it totally kills it for me, same with some of the throwing animation but that isn't as big a deal as the hitting to me. I would have loved to see a new in game presentation where after the batter gets a base hit the camera shows the first base coach patting the batter on his behind or clapping his hand and and maybe talking to him into his ear. Heck even show the batter talking to the first basemen! They show this all the time though out real life baseball games on TV. But this kind of in game presentations has never been in MLB The Show and I was hoping 19 would be the year. All we seem to get after singles is players getting so excited pumping their fists at to many times where in real life they would never do it! Dude we get it. You hate the color of the grass in this game. Your in like 4 other threads talking about the color of the grass. Was your father a landscaper or something? Because you seem way to consumed by the foliage in this game. This has been my issues for the past several installments and it really only started bothering once they cut out the PS3 version. I was able to forgive it before but it is such an eye sore to me now especially when batters perform practice swings and they kind of slide back in their stance it's really jarring and weird to me. Or if nothing else, use the schedules from real life past years in the game. Also, have an option for schedules that don't have interleague games. The Show also really needs revamped fielding controls, particularly in regards to detection ranges and animations. I could forgive the hicups when they existed in the PS3 era but those problems still happen now since almost nothing has been added or changed. Issues really seem to crop up when controlling outfielders when tracking fly balls. Half the time you'll stop a few feet from the target area thinking the animation will kick in and you'll get an easy catch out of it, only for the fielder to stop dead in his tracks instantly and let the ball hit the ground. Then you have the times where you'll be chasing a fly ball and you're afraid of the first outcome happening so you hold the joystick until you're directly under the ball and no animation will trigger as your player awkwardly keeps running past it. The game also has a serious problem with tracking ground balls in the outfield, I've had dozens of times where I try to use my outfielder to cut off the ball before it rolls to the wall in an attempt to prevent runners from getting extra bases, it's pretty much a 50/50 whether or not an animation will trigger where they pick the ball up or if your player will just continue running and let the ball awkwardly go through his legs. This a million times over. I hate seeing players act like they just hit a World Series game 7 walk off home run when they get a first inning single in game 4 of Spring Training. That’s because baseball’s popularity is dying! Very few people under 35 care about baseball. It’s either football, basketball or soccer. yeah, I feel the same way. I honestly don't think there's much more they can do with this game in it's current engine and platform. The PS4 games peaked way earlier than the previous PS3 counterparts and I think expectations have gotten too high because of that. Do I? Because last I checked this is a graphics thread, and the graphics in this game are just not very good anymore. I have commented mainly about fields in two main threads, franchise where appropriate, et cetera. The field happens to be a pretty big problem in this game, and in baseball the field is a pretty big point in a viewer's perception. It's also not just grass. It's uniforms, animations, et cetera. All of them are up there. The grass just looks so pathetic it stands out even more. Pretty sure I am not the only one that feels that way since the issue is brought up by many people here commenting on the grass and dirt. Also, your post is useless. It's just more whining against the criticism of the game. If your little self can't handle it then buckle up and drive away. Nobody cares you need to defend the mediocrity we all see setting in. Waiting for PS5 is not really just an option. We don't know how improved if at all any of this stuff will be on PS5. The grass has improved over the years (I was as big an adversary as anyone), though it still has that splotchiness. I imagine we won't see changes to that until next-gen. I don't know, man. That may true to a point, but there's definitely younger people that love the sport. You crazy, game looks great as far as I’m concerned. I just don’t know what some expect. It’s a video game.